Kansas City, Mo. 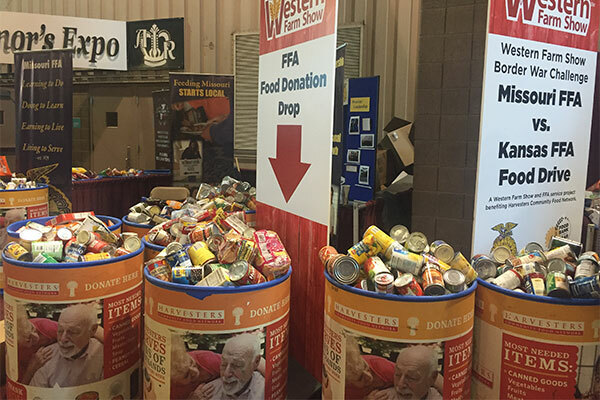 (March 5, 2019) – FFA students from Missouri and Kansas collected and delivered 3,111 non-perishable food items for the annual “Border War Food Drive” at the 2019 Western Farm Show at the American Royal in Kansas City. More than 3,500 students from the two states attended the show on FFA Day, Friday, Feb. 22, where they also had the opportunity to participate in educational seminars and learn about career opportunities in the ag industry. About 70 chapters from Missouri participated, collecting 2,143 food items. The top chapters were Lone Jack (504), St. Joseph (233) and Gilman City (217). Lone Jack once again had the highest total of all chapters from both states, a feat they have accomplished in seven of the last eight annual Western Farm Show food drives. The chapter will receive a $500 prize for their accomplishment. Nearly 20 participating Kansas chapters brought 968 items to the show, with the highest totals from Louisburg (304) and Tonganoxie (280). That ranked them second and third overall from both states, just behind Lone Jack. The food was donated to the Harvesters – The Community Food Network, a Kansas City-based regional food bank that serves a 26-county area of northwestern Missouri and northeastern Kansas. In the eight years the Western Farm Show food drive has been conducted, more than nearly 34,000 pounds of food have been delivered to Harvester’s which provided more than 28,000 meals for those facing food insecurity. 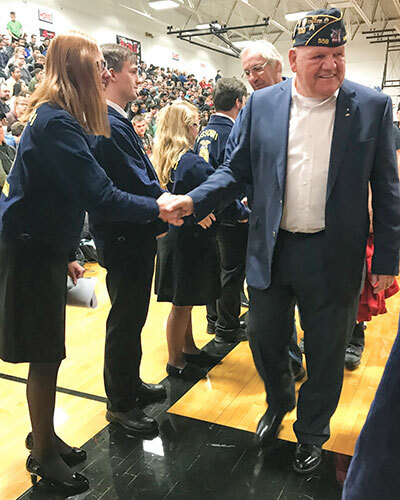 “We’re so grateful to these FFA students and the Western Farm Show, and appreciative of their continuing commitment,” said Gene Hallinan, communications manager for Harvesters. Produced by the Western Equipment Dealers Association, the annual Western Farm Show features over 500 exhibitors and more than 400,000 square feet of floor space showcasing one of the largest indoor displays of farm equipment and other agricultural products in the Midwest. Other attractions include the Low-Stress Livestock Handling Demonstration, the Health & Safety Roundup and Family Living Center. Imagine it. Improved conception rates and litter sizes for your hog operation. Through their animal systems agriscience experiment, Troy FFA members Dylan Sparks and Izabella Hutton Kidwell, aimed to provide commercial, show pig and seedstock farms valuable information to improve productivity. Their experiment earned Dylan and Izabella first place honors in the animal systems, division 4 category, of the National Agriscience Fair. The duo analyzed the type of artificial insemination (AI) rod used and how it affected conception rates and litter sizes. Their interest spawned from pork being the most widely consumed meat in the world, emphasizing the importance of increasing conception rates and litter sizes on hog operations. Dylan and Izabella found that intrauterine or transcervical rods provide the best conception rates and litter sizes in the swine breed using artificial insemination. In fact, their data found almost twice the litter sizes and conception rates in the swine breed with the intrauterine rod. Plans are already underway for this year’s Missouri Agriscience Fair. Registration and papers are due May 7, with the event set for May 14 at Memorial Union on the University of Missouri-Columbia campus. Get additional details online through this link: Missouri Agriscience Fair. 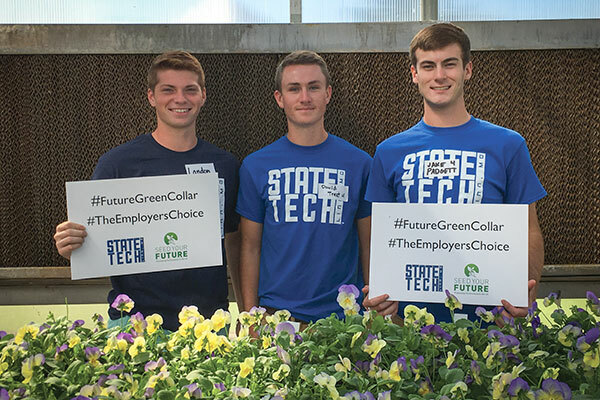 Students in the agriculture program at State Technical College of Missouri are landing internships and full-time jobs at many high-profile companies in the turf and landscape fields. Just this year, State Tech had students on the athletic fields during the U.S. Open, World Series, Super Bowl and 100th PGA Championship. Their students are developing practical skills through multiple hands-on opportunities to prepare them for their careers. Ryan Klatt, agriculture department chair and instructor, and Nick Rackers, instructor, make up the two-man teaching staff within agriculture at State Tech. Students pursing the commercial turf and grounds management degree take courses for two years with a required six-month internship between the first and second year. The opportunity to work an extra season, as opposed to just the summer, provides students an opportunity to get more out of their internship experience by seeing how companies operate in two peak seasons of the year, spring and summer. While the students are in classes, they are maintaining the landscape of the State Tech campus. Students are responsible for mowing, designing the landscaping, growing and planting flowers and even pruning trees and shrubs. Rackers has focused on creating a diverse, botanical garden feel over the campus by labeling each plant with its scientific name. One of the first courses students will take in the agriculture program is equipment operations, where they learn how to run a variety of mowers, mini excavators, skid loaders and multiple other pieces of equipment. Students are receiving internships with landscape companies, golf courses and on athletic fields. Klatt and Rackers are able to direct students toward a company, which fits their interests. They use industry connections to guide students in the right direction, but they also encourage students to become student members of certain associations, that often provide job boards where applications for some of the high-profile internships can be found. Over the past several years, students have worked for a variety of teams, including the Kansas City Royals, San Diego Padres, St. Louis Cardinals, Houston Astros, Kansas City Chiefs, Philadelphia Phillies and Boston Red Sox among others. Additionally, students have worked at the PGA Championship and the U.S. Open. In 2018 alone, State Tech had students representing the program during the U.S. Open, World Series and Super Bowl. In addition to the hands-on experience during internships and through coursework, State Tech students in agriculture can be members of and participate in PAS (Professional Agricultural Student Organization). The professional career-building component of PAS provides students with the opportunity to expand their professional development skills through a practical application. This past year, State Tech brought home multiple awards from the state conference. Additionally, students who are landscape-focused can attend the trade show at the Western Nursery and Landscape Association (WNLA). Currently, two State Tech students have been nominated to sit on the WNLA advisory board for the next two years. Klatt and Rackers are helping students develop the skills and resume necessary to be successful in the turf and landscape fields. However, both said it is a lot more than just learning how to mow grass. For more information about the State Tech Commercial Turf and Grounds Management program, please visit www.statetechmo.edu or follow them on Facebook @statetechctg. In just its first year, Oak Ridge FFA is already making huge strides by having 50 percent of high school students enrolled in the chapter. Oak Ridge began building the framework for its agricultural education program a few years ago. With the passage of a bond issue in spring 2018, funds were available to construct a shop, employ an agricultural education teacher and begin the first FFA chapter in school history. Oak Ridge FFA Advisor Nick Thiele said community support has been overwhelming and student interest has been high. Due to the hard work of a number of people, Oak Ridge has enjoyed a rich tradition of academic excellence and successful student activity programs. “Our high school has been in existence since 1874, and we have always been a diversified agricultural area,” Thiele explained. Oak Ridge FFA has already elected officers, established a Facebook page and held its first fundraiser, bringing in $1,100. Chapter members have attended local fairs and FFA Field Day at Barton Research Farm. Oak Ridge has also held a Greenhand initiation event, and the chapter is working to help build members’ SAEs. A chapter chartering ceremony is also being planned, and members expect to participate in area, district and state contests this spring. Crop research plots on the school farm are in the works for Oak Ridge. And, the chapter hopes to complete both the interior and exterior of its new shop. Plus, the chapter has plans to work with area 4-H leaders, establish a farmers market and volunteer at a therapeutic horsemanship ranch. Thiele explained that Oak Ridge also hopes to be actively involved in its community and school. The chapter’s goals include using a greenhouse to provide hydroponic vegetables to the school and collaborate with other student organizations to disperse and market their produce. Next year, members plan to volunteer at community clean up events. The chapter hopes to recruit even more members through an Ag Exploration class offered to junior high students, teaching them about agriculture and FFA. Thiele said FFA members are keenly aware of their role on the school’s campus and in the community to make FFA visible. “(Members) know their actions and enthusiasm will create some of the best recruiting opportunities,” he explained. Students said offering FFA at the school is an honor. Chapter President Hayden Seyer and Vice President Dylan Muench are thankful FFA is now offered at their school. Muench wants to help educate others about how food is produced and the purpose of agriculture. He also hopes to focus on his SAE, which includes working on his family’s other local dairy farms, as well as showing dairy heifers. Seyer said FFA is a great addition for their school and relevant to career goals. He also is proud to serve as the chapter’s first president, being an integral part in developing new chapter traditions. “I want to ensure our FFA builds a solid foundation during our first year,” Seyer said. 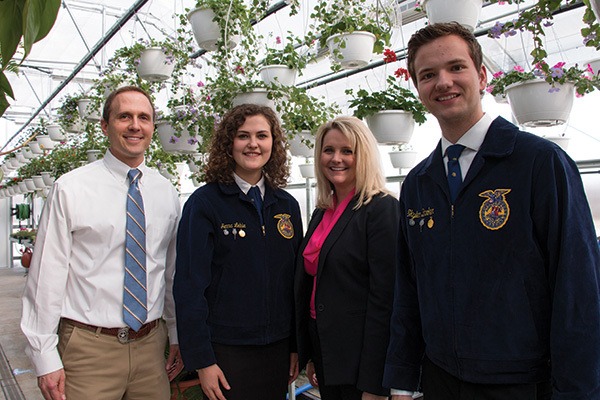 In addition, Seyer knows that FFA opens opportunities for students to become involved. 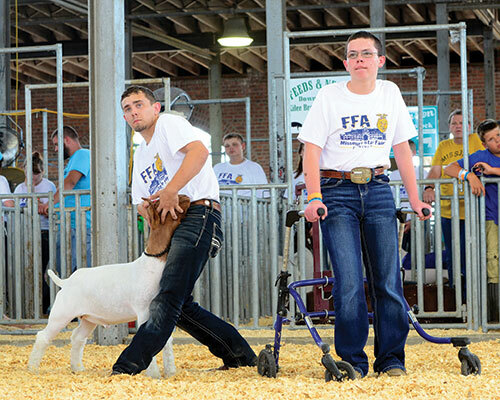 FFA has allowed him to build on skills he learned in 4-H. 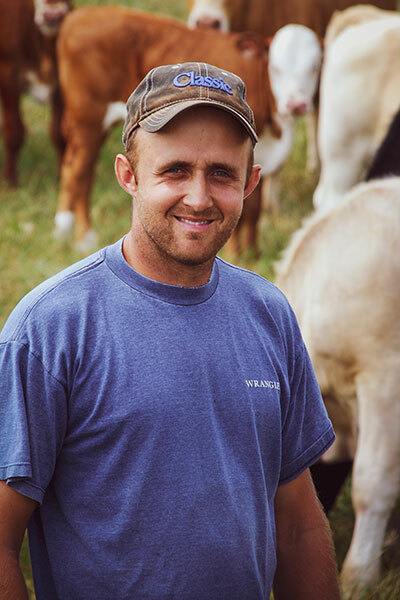 He also is able to showcase his role on his family’s row crop and beef cattle operation through his SAE. 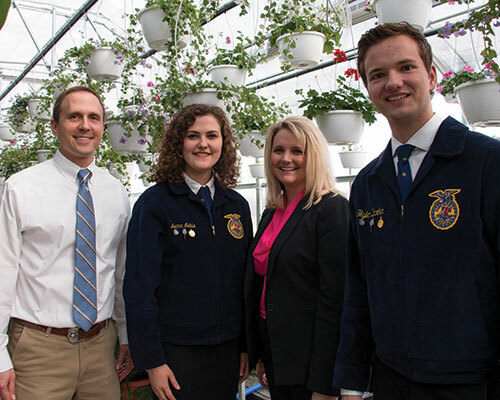 Missouri Deputy Director of Agriculture Garrett Hawkins is a small-town farm boy rooted in FFA. PastMissouri FFA member Garrett Hawkins is a small-town Missouri boy who likes to run, hunt and work on the farm. Sound familiar? Although he enjoys his work, Hawkins admits some parts of the job can be challenging. “I always like to say that when we make a decision, we have weighed all options and done everything we can to make an informed decision,” Hawkins says. One of the leadership opportunities he was empowered to pursue was becoming a Missouri FFA State Officer in 1998. 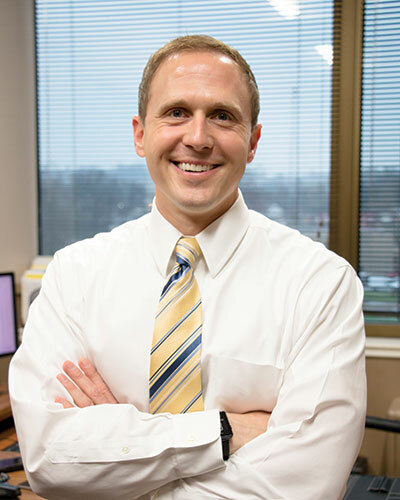 His role as first vice president allowed him to further develop his public speaking and interpersonal skills, but most importantly, it gave him a taste of what he could help others accomplish by stepping up as a leader. 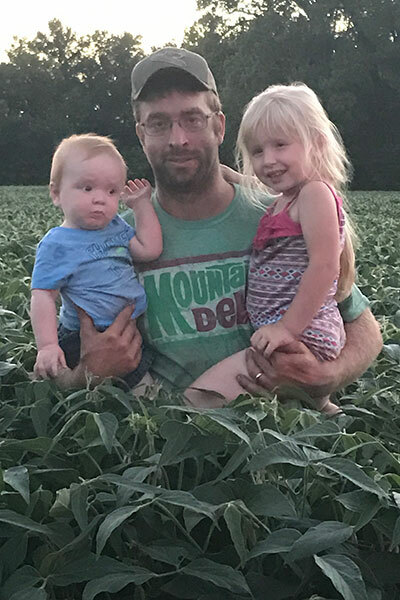 This passion for Missouri ag policy was brought even closer to home when Hawkins, his wife Jennifer Hawkins and his children Adelyn, Colton and Tate, moved home to Hawkins’ family farm in Appleton City, Missouri, two years ago. He hopes to instill a love for working on the farm in his children, just like he and his wife had on their individual family farms. 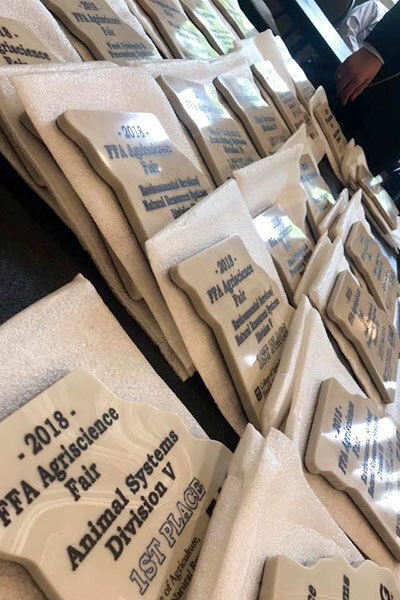 For many FFA members, their Supervised Agricultural Experience (SAE) can create a pathway to their future endeavors, as well as lead to nationally recognized success. We caught up with some of the 2018 national finalists. How did those members establish and grow their SAE projects to reach top honors? Read on as they explain how they built and managed their award-winning SAE projects. 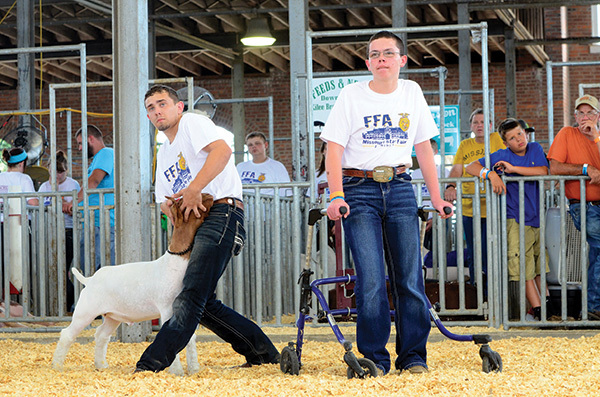 From the Ashland FFA Chapter, Riley Tade was a national finalist in goat production. Tade’s SAE focuses on raising market wethers to sell to other 4-H and FFA members. His project began with seven does that were purchased to clean up brush and sell for meat. Tade began exhibiting his goats, which led him to change bloodlines and focus on raising a higher-quality animal. His herd has grown to 15 Boer-cross does and 10 Kiko does. With the change in genetics and direction in his herd, he is able to sell his goats for a profit. “Once people have seen the goats that I show and sell, it has made it easier to market them,” he said. Tade explained the importance of keeping records to track progress, setting goals and working hard to achieve those goals to build a successful SAE. In addition, he said it is key to listen and learn from other people who are knowledgeable in their SAE area. A strong support system is also key. Tade said his FFA advisors and parents helped him reach his goals. He has learned to always strive to improve his SAE through monitoring buying trends and then meeting those with a desirable animal. He encourages other FFA members to have fun with their SAE and meet people that will help them achieve their goals. Jacob Dierking, a senior from the Santa Fe FFA Chapter, was a national proficiency finalist in grain production. His SAE began when he was given the opportunity to rent a field from his neighbor. He grew corn on the field and has since expanded his corn crop to 86 acres. The money he earned was used to purchase needed farm machinery including two tractors and other essential farm implements, to help produce the crop. “I have a passion for farming, and that is what I enjoy spending my time doing,” Dierking said. In addition, Dierking said his SAE taught him to work hard to achieve his goals, which he believes is the first step to building a successful SAE. “Whether your goals are big or small, it helps to always have something to look toward and build upon,” Dierking said. Dierking said he dedicated a lot of time to his SAE and took advantage of opportunities that helped him expand his project. He encourages new FFA members to try different areas when beginning their SAE, finding a project they enjoy. Doing so will hopefully help them create an SAE that can transform into future plans, which has been the case for Dierking. “I plan to expand my SAE into my life career of farming after I attend a two-year college,” he explained. Grace Box, from the Neosho FFA Chapter, raises mums for her SAE project. A 2018 national finalist in the specialty crop proficiency award, Box grows Belgium hardy mums and markets them through her business called “Gracie’s Mums.” Box began by growing 100 mums in six different color varieties. Her business has now expanded to 400 mums in four different color varieties based on the previous year’s demand. Box’s customers have helped her business blossom. A Facebook page helps with advertising needs. She has followers not only from the Neosho area, but also from Kansas, Arkansas and Oklahoma. “I would not be where I am right now without my family, agriculture teachers, friends and my towns support,” Box explained. Box thought raising mums would be a unique SAE since no one else in her chapter had the project. She advises young FFA members to think outside the box and choose a project that helps set him or her apart. Members should then stay committed to their projects because it will be worth it in the end. Riley Tade (right), a member of the Ashland FFA Chapter, earned honors as a national finalist in the goat production proficiency award area at the 2018 National FFA Convention. He said he learned the value of record keeping, hard work and setting goals through his Supervised Agricultural Experience project. Eleven Missouri FFA members were selected as national proficiency finalists and competed at the National FFA Convention in October. How did those members establish and grow their SAE projects to reach top honors? We caught up with some of this year’s national finalists. Read on as they explain how they built and managed their award winning SAE projects. “Once people have seen the goats that I show and sell, it has made it easier to market them,” he said. Tade explained the importance of keeping records to track progress, setting goals and working hard to achieve those goals to build a successful SAE. In addition, he said it is key to listen and learn from other people who are knowledgeable in their SAE area. A strong support system is also key. Tade said his FFA advisors and parents helped him reach his goals. He has learned to always strive to improve his SAE through monitoring buying trends and then meeting those with a desirable animal. He encourages other FFA members to have fun with their SAE and meet people that will help them achieve their goals. 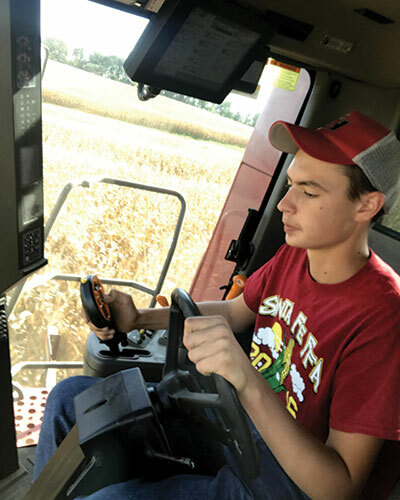 Santa Fe FFA member Jacob Dierking plans to continue growing his Supervised Agricultural Experience (SAE) project in the future as he enters production agriculture as his career. He was a 2018 national finalist in the grain production proficiency award area. “Whether your goals are big or small, it helps to always have something to look “toward and build upon,” Dierking said. Grace Box, from the Neosho FFA Chapter, raises mums for her SAE project. 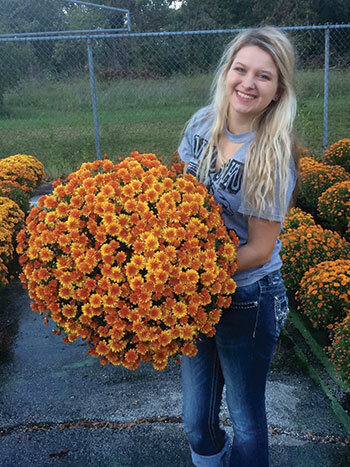 Neosho FFA member Grace Box chose to raise mums for her Supervised Agricultural Experience (SAE) because it was a unique project. With the help of social media, she’s expanded her business to include customers in neighboring states. A 2018 national finalist in the specialty crop proficiency award, Box grows Belgium hardy mums and markets them through her business called “Gracie’s Mums.” Box began by growing 100 mums in six different color varieties. Her business has now expanded to 400 mums in four different color varieties based on the previous year’s demand. “I would not be where I am right now without my family, agriculture teachers, friends and my towns support,” BoxBox’s customers have helped her business blossom. A Facebook page helps with advertising needs. She has followers not only from the Neosho area, but also from Kansas, Arkansas and Oklahoma. From planning to creating activities that encourage member and community involvement, both Marshall and Paris FFA Chapters know what it takes to be among National FFA’s top chapters. Both chapters will be recognized for their efforts as Model of Excellence finalists this month at the National FFA Convention in Indianapolis, Indiana. Marshall is also a premier chapter in the growing leaders category. Paris FFA works to create activities that compliment National FFA’s Model of Excellence component of the National Chapter Award program. Activities such as Bacon Math Fun, Old Timer Barnwarming and Paris FFA Aggie Days are some examples of their events. Advisor Josh Bondy said chapters should find a need, create an activity and ask members what they are passionate about. Plus, community support is key to the chapter’s success. According to advisor Jaelyn Peckman, their community is the backbone of their chapter because of its constant support and guidance. “We are very thankful for our community support, and we realize this support makes new opportunities possible for our chapter,” she said. Marshall FFA Advisor Tyler Burgin recommends chapters put a unique spin on activities already planned. He said doing so adds impact and reaches more people. Plus, both he and advisor Emily Reed said including officers and members in the planning and implementation of chapter activities is key to planning successful chapter activities. “This is a student-led organization, and students take more pride in themselves and the chapter when they have to do something on their own,” Reed said.